In many regions of the world, particular environmental factors have given rise to mass emergences of adult black flies, and the females of many species then actively seek a bloodmeal. Bloodsucking females are important pests and are vectors of disease organisms in humans and in both domestic and wild animals. Worldwide, they are directly responsible for serious economic losses and even deaths among cattle. Within the context of medical and economic zoology, the Simuliidae are one of the best-studied groups of lotic insects. Adult black flies are able to transmit filarioid worms and blood protozoans to a wide range of vertebrates. In parts of the tropics, they are responsible for the transmission of Onchocerca volvulus, and onchocerciasis or "river blindness" is recognized as a major endemic disease, mainly in Africa and Central and South America. 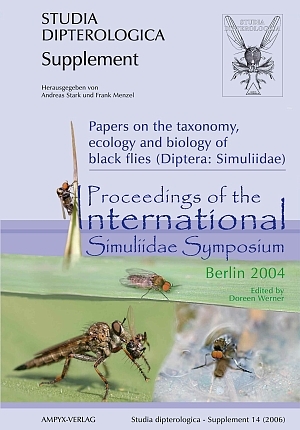 In 2004, the Simuliidae working groups of Central Europe and Great Britain met together to take part in an International Simuliidae Symposium, held from 15 to 18 September at the Humboldt-Universität zu Berlin, Germany. With 38 delegates from 16 countries (Austria, Belgium, Canada, Czech Republic, Finland, France, Germany, Great Britain, Italy, Lithuania, Norway, Serbia-Montenegro, Russia, Slovakia, Sweden, USA), this was the largest European meeting of its kind to be held. In total, 35 scientific presentations were given, with the emphasis predominantly on taxonomy and systematics, history, ecology, transmission of disease agents, medical and veterinary aspects, and control. The major part of lectures held in the symposium is presented in this current issue of the Supplementum series of Studia dipterologica. It is a pleasure to acknowledge the financial and other support from the following organisations without which it would not have been possible to hold this Symposium: the Institute for Biology and the Institute for Tropical Medicine of the Humboldt-Universität zu Berlin, the Deutsche Forschungsgemeinschaft, and the Berlin Water Companies. Hall and Woodhouse (UK) kindly donated a quantity of their "Blandford Fly" beer. Publication of this special Supplement has been made possible by a grant from the Humboldt-Universität zu Berlin.